TKp1-77, Poznań Główny depot, August 1962. Photo from my collection. DRG class 925-10 side drawing from TB vol.2; © Lokomotiv-Revue. 92 508, DR (ex KPEV Essen 7906) somewhere in Germany, location and date unknown. Postcard from my collection. TKp1-46 (ex DRG 92 973), Union 2226/1915, plinthed near the Bydgoszcz Główna station. Photo taken on March 9, 2013. Another photo of the TKp1-46, taken on the same occasion. An unidentified KPEV T17, location and date unknown. Source: Die Lokomotive February 1922. Built for KPEV and numbered Berlin 7929 (Union 1976/1912), this engine went to ČSD in 1918. Re-numbered 415.009, it fell into German hands twenty years later to become DRG 92 1109. Photo taken in Aussig in 1939. Returned after the war, this locomotive was finally withdrawn in November 1964. Source: Eisenbahnen im Sudetenland (see References). DR 92 821 (ex KPEV Halle 7907, Grafenstaden 6835/1915), photographed at the Cottbus depot. Available description gives ‘December 1969’; however, according to www.beitraege.lokomotive.de, this engine was withdrawn in July 1968. Photo from my collection. DR again, this time 92 598 (former KPEV Hannover 7907, Hanomag 6409/1912), Jänschwalde, Germany, October 7, 1973. Withdrawn in March 1970, it remained in use for some time with special trains. Photo by Reinhard Preuss (from my collection). 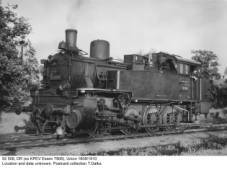 In 1910, Union-Gießerei of Königsberg delivered the prototype of the first Prussian tank engine with four coupled axles, classed T13. 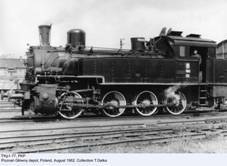 Although earlier T12, designed for passenger traffic, featured steam superheating, new engine ran on saturated steam. It was a relatively simple and straightforward design, with 1250 mm drivers and maximum speed set at 45 km/h. The boiler was adopted from earlier T11, with only minor modifications. First three axles were fixed in the frame and the fourth one had side-play of ± 20 mm. This engine was intended mainly for switching and secondary lines, but later served also with S-Bahn in Berlin and on suburban lines. Between 1910 and 1916, Königlich Preußische Eisenbahnverwaltung (KPEV) received 512 T13s. Sixty more were built for Reichseisenbahnen Elsaß-Lothringen and ten for Großherzoglich Oldenburgische Eisensbahn. T13s used in Oldenburg, all built by Hanomag, were probably considered very powerful machines; at least this is suggested by individual names, which included ‘Titan’, ‘Herkules’ and ‘Gigant’. Their development was class T131, which featured steam superheating. Four such engines were built by Hanomag in 1921 (service numbers 286 through 289, later DRG 92 401 through 404); they were heavier by three tonnes in working order. Most sources add twelve more T13s for Saarbahn, but this refers to a batch built between 1922 and 1923. Moreover, between 1921 and 1922 further 72 examples were built for KPEV, bringing the total output to 666. Most of these were built by Union, but some came from Grafenstaden, Hanomag, Henschel, Hohenzollern and Hagans (Wolf). ). This type is often referred to as Bauart Union, in order to distinguish it from earlier T13 Bauart Hagans. The latter, delivered between 1899 and 1902, was a different design, intended for mountain lines with tight curves as a supplement for larger and heavier T15; only 29 were built and this type was never used in Poland. 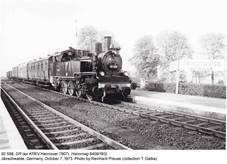 After WWI, German railways took over 413 engines, classed 925-10 (service numbers 92 501 through 913). T13s built against the KPEV order after the war were given service numbers 92 1001 through 1072. 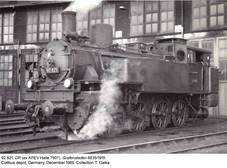 After incorporation of Saarland into the German Reich in 1935, further 32 engines followed (92 919 through 950). According to EZ, Czechoslovakian state railways ČSD took over twelve T13s in 1918. Classed 415.0, they remained in service until 1938, when they were taken over by DRG and impressed into service as 92 1101 through 1112. In 1945 they were all returned and the last was withdrawn from the ČSD service in 1966. Several T13s served also with Belgian railways (class 99) and with SNCF in France (class 040TC). Some Belgian engines were later purchased by Luxembourg and served there as CFL class 41. 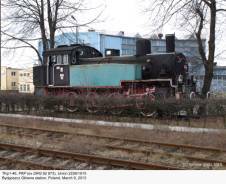 Polish state railways PKP received 43 engines of this type. They were classed TKp1 and assigned to regional railway managements in Gdańsk, Katowice, Radom and Warsaw. All survived in service until 1939. At least two ex-Prussian T13s were used in makeshift armored trains during the 3rd Silesian Uprising in 1921; not much is, however, known about this episode in their life. Most probably these were ‘Kattowitz 7916’ (Union 1907/1911) and ‘Kattowitz 7918’ (Union 1958/1912); both were ‘mobilized’ in May 1921 and taken over by PKP in June 1922, to become TKp1-11 and TKp1-14, respectively. In Germany, at least 79 engines of this type were withdrawn from service before WWII. This is a little surprising, as some of them were merely twenty years old on withdrawal. Seventeen went to industry and three to various local railways. After the September campaign, almost all (forty) Polish TKp1s were taken over by DRG and designated 92 951 through 990. Only three (TKp1-7, -8 and –9) fell into Soviet hands; two were later re-captured by Germans and the fate of TKp1-8 is unknown. Most of these locomotives – in fact all but four – were returned after 1945. Apart from them, PKP impressed into service further 56 engines, bringing their total number to 94. Most were based in north-western Poland (Gdańsk, Poznań and Szczecin). Three of them, after a brief period with PKP, were taken over by Silesian ‘sand railways’; one more, with no PKP number assigned, went to industry in late 1940s. TKp1 could hardly be considered a modern engine after WWII, so withdrawals started comparatively early; only a handful survived with PKP until mid-1960s and the last one was written off in 1967. Several more, transferred to industrial establishments (mainly foundries and CPN – Commercial Centre of Oil Products) in the 1950s, survived until early 1970s. In 1955 three ex-PKP TKp1s were converted into fireless locomotives, by fitting new ‘boilers’ (in fact steam containers); they were re-designated TKp1b (b stood for ‘bezogniowy’, or fireless) and all went to industry. 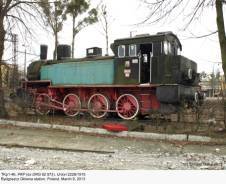 One engine has been preserved in its original version; TKp1-46 (Union 2226/1915, KPEV Kattowitz 7958, then TKp1-26 and DRG 92 973), withdrawn in October 1967 as the last engine of this type with PKP, has been plinthed at the Bydgoszcz locomotive depot and can still be seen there. Strictly speaking, it was outlived by the TKp1b-1, which served until 1985. After the war, DB received 184 engines of this type and the last of them, 92 739, was withdrawn from service in December 1965. With DR (which received 64), last examples survived until early 1970s. Another major recipient of ex-Prussian T13 was Soviet ministry of transport (MPS), which took over 105 ex-DRG engines. They were classed Tь (T stood for ‘trofeinyi’, or booty, while ь is in Russian a phonetic symbol with no Latin equivalent), but this class included also some other four-axle tank engines running on saturated steam, such as ex-Bavarian R4/4 (DRG 9220) and ex-Austrian 178 (DRG 9222-23). They served as switchers and with suburban traffic. Last were withdrawn in early 1970s, many went to industry. Finally, ÖBB took over four engines, impressed into service as class 792; last were written off in 1961. Apart from Polish TKp1-46, at least three T13s have been preserved in Germany. 1) Including 512 for KPEV, 60 for Alsace-Lorraine, 10 for Oldenburg, 12 for Saarbahn and 72 for DRG. 3) Some sources give 1923. - Eisenbahnen im Sudetenland by Siegfried Bufe and Heribert Schröpfer (Eisenbahn-Kurier e. V., 1975).